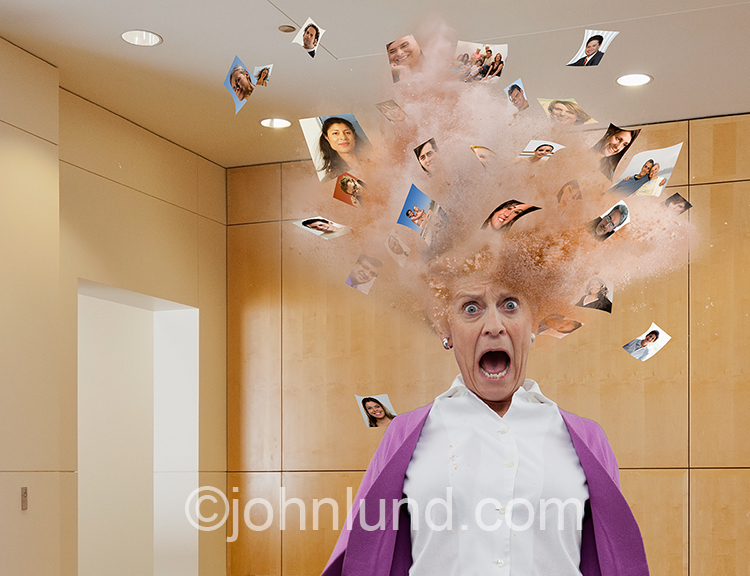 In a social media overload image a woman's head explodes into individual people portraits. With the disappearance of Corbis, somehow being swallowed up by Getty without being bought by Getty (huh? ), the continuing success of the new “tech” stock agencies like ShutterStock and Stocksy, 500px and the probable success of Adobe Stock, the landscape in our industry continues to change. For an old timer like me it is a challenge to keep up with it…but I try! More than ever, I believe, that to excel in stock photography one has to find a way to get what I call supplemental exposure for one’s work. It is a mistake to just sit back and hope/expect the agencies to garner sufficient eyeballs for your work. It is the stock shooter’s equivalent of the assignment photographer’s necessary and constant efforts at marketing. For me that effort is coming down to SEO work on my website and the use of social media. I have to confess here that I have been a social media hater. I have tried, but have a hard time committing to the time it takes to engage with social networking. But that is changing. I am changing. In the past couple of weeks I have made a stronger effort to participate in social media in a several ways…and it started with Blend Images. As regular readers of this blog already know, I am a part owner of Blend Images, a photographer owned stock agency. Blend Images has a great new website (check it out) that facilitates social engagement and I have started making the most of it…liking images, pinning them, tweeting them and sharing them on facebook. As much as I hate to admit it, I am starting to enjoy it! I am also experimenting with facebook ads. They are really pretty cool. You can drill down deeply in choosing the parameters for an audience. There is great flexibility in setting up the schedule for adds, setting budgets and so forth. There are also very few options in creating the ad itself…which is wonderful! I don’t have to spend agonizing hours figuring it out. That is great because I would much rather be spending my time creating stock photos. As I have done for years, I also continue to upload my images to my website with plenty of text on each page, alt text for the images and so forth. The facebook ads get my work in front of new people, the website and SEO work helps people looking for specific images find mine. Too bad so many of them are looking for free images...oh well! At this point my stock photo strategy is to keep working on my website SEO…which is great for reaching people who are looking for an image, participate in social media which builds my brand (and that of Blend Images), and advertise on facebook…which further builds my brand and sets the stage for future stock photo sales. Geez…I’ve been converted! Oh well…gotta go pin/share/tweet an image! Thanks so much for the insight and encouragement, John! We met briefly at the Blend meeting in LA in March but didn't get much time to chat. Question: when you place your ads on Facebook, what entity are you advertising?--your assignment business? direct stock sales? Blend? something else?